Tiffany lights are one of the most iconic and easily recognisable styles of lighting because of the use of stained and art glass pieces. All the Tiffany lighting we offer here at Bespoke Lights are handmade and lovingly created from pieces of stained glass in much the same way as the original Tiffany lamps made way back in the late 19th century. Making the Tiffany shades is a complex process – firstly the shade is designed and then skilled artisans trace out the pattern and hand cut each individual piece of stained glass in the correct colour and shape. Each piece of glass is cleaned and numbered before the edges are copper foiled. The shade is then formed by soldering the pieces of glass together on the inside and again on the outside to strengthen the construction. A bronze patina is applied to the solder which is hand waxed for protection before the shade is finally polished to give it its lustrous finish. The average Tiffany shade takes around 80 hours to create and uses from 40 up to an impressive 650 individual pieces of stained glass. 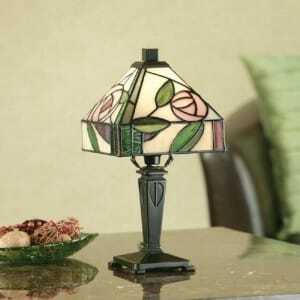 The first Tiffany lamp was created around 1895. 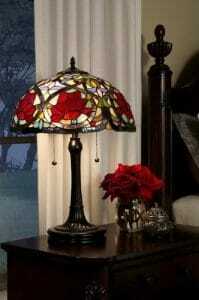 Louis Comfort Tiffany was the son of a prominent American jewellery retailer and lived from 1848 to 1933. 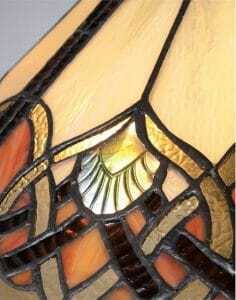 He became an innovative and artistic interior designer who also designed stained glass windows. He came up with the idea of recycling the high quality pieces of glass discarded during the manufacture of the stained glass windows to form beautiful decorative lamps. 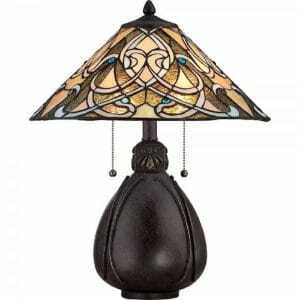 As the lamps became fashionable in the early 1900’s his unique style was at the forefront of the developing Art Nouveau movement. Tiffany employed craftsmen to work on the designs and glass cutting and at its peak his famous Tiffany Glass Company, which later became known simply as ‘Tiffany Studios’, employed more than 300 artisans. Among these were a group of women who became known as the ‘Tiffany Girls’. The director of this group of women was Clara Driscoll who has recently been recognised and identified as the designer behind some of the most creative and valuable lamps made by the Tiffany Studios. Original Tiffany lamps made and created at the Tiffany Studios in New York are still highly regarded and collected all over the world. Most are now in museums and private collections and when they do occasionally come on the market they are beyond the reach of most people. In May 2015 Sotheby’s in New York sold an original Tiffany Oriental Poppy floor lamp for over $1,000,000 (a mere snip at £690,915.00). 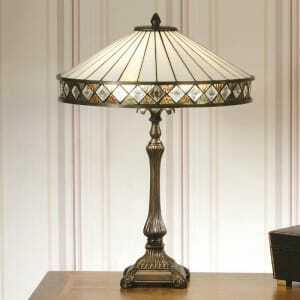 Today the name Tiffany or Tiffany style has come to include many decorative items that feature stained and art glass. Here at Bespoke Lights we carefully select our Tiffany reproduction lights to ensure they are made to the same exacting standards and capture the same magical spirit as the Tiffany originals. 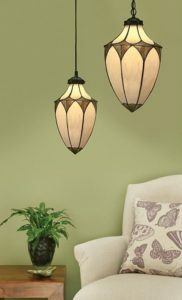 Many of our classic designs still feature the same flowing botanical Art Nouveau patterns, including the iconic dragonfly, flowering lotus and poppy patterns made famous by the original Tiffany Studios. Designs that were inspired by the talented Scottish designer Charles Rennie Mackintosh who was hugely influential in the Art Nouveau movement are also extremely popular. 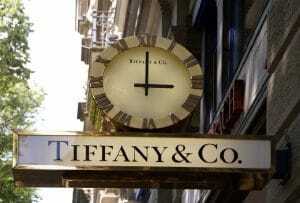 Current designers, continuing in the Tiffany tradition, create new ideas every year concentrating largely on Art Deco themes and American Mission styles. 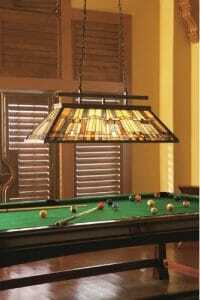 Over the years lighting trends come and go but the enduring appeal of Tiffany lights has remained constant. 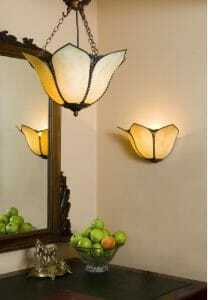 With their beautiful and distinct designs they fit effortlessly into most interiors. These are unique yet affordable investments that will be cherished for years to come. ← Previous Previous post: How to Light a Victorian Home in an Authentic Style.